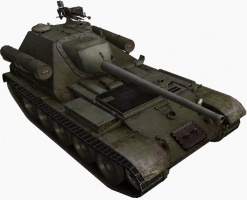 The SU-101 is a Soviet tier 8 tank destroyer. An experimental tank destroyer that was intended to replace the SU-100. In April–May 1945, two prototypes were built and passed trials. Decent technical characteristics did not help the project succeed, and, after the end of the war, it was discontinued due to the impracticality of launching production of a new vehicle based on the war vehicles. This tank plays in much the same way as the SU-100M1, and has similar strengths and weaknesses. With the addition of the 122 mm M-62 gun, the SU-101 does have more options when it comes to playing as a sniper now. The SU-101 leads to the Object 263. With the recent buff, the SU-101 now performs best as a second line assault tank. It now has 1,100 HP, as well as additional armor to boot. The 122 mm M-62 is a very powerful gun at Tier 8, boasting good shell damage, excellent penetration, and acceptable accuracy. It is a huge improvement over the 100 mm D-54S, which generally lacks the penetration to be a competitive tank destroyer gun at Tier 8 without resorting to premium ammunition. With 258 mm of penetration on the M-62 and a respectable 440 damage-per-shot, the SU-101 remains a relevant threat even in Tier 10 games. In addition, the SU-101 still maintains its superb mobility, on par with most medium tanks, which makes it an excellent flanker or support tank for groups of medium tanks. Having said that, the SU-101 is still a flawed machine: the exceptionally poor gun depression and gun traverse arcs mean that it will often struggle to bring its gun to bear over uneven terrain. A good knowledge of maps and terrain is required to compensate for this. The armor of the SU-101 may seem impressive at first, but that is somewhat misleading in actuality. At long range, the armor will get some bounces and the gun mantlet might absorb a few shells, but faced with high penetration guns on heavy tanks, some mediums, and most TD's, the shells will go right through without a problem. Sixth Sense and Camouflage are absolutely essential for this tank. Due to the low durability, this tank relies on its camouflage and rate-of-fire. The SU-101 can also be expensive to use, with very expensive ammunition and (for a TD) relatively high repair cost, it can be difficult to make a profit on a loss. It is easily possible to lose money on a win if a number of shots miss, fail to penetrate (which will happen quite often in Tier 9 and 10 games), or if HEAT is used and the vehicle gets damaged. Nothing carries over from the SU-100M1, but several carry over from the T-44 if you've already researched it. You need to unlock the 100mm D-54S gun right away, the 175mm penetration on the 100mm D-10s is inadequate for a Tier 8 tank destroyer. Next, research the V-2-54 Engine. Now, research the SU-102 Suspension. You now have sufficient weight capacity for the heavy guns. But note that mounting the D-25-SU-101 gun is not advised; its accuracy emulates that of howitzers. Just grind for the M62-C2. research the R113 Radio, but you my have this unlocked from the IS line or T-54 line. The SU 101 and SU102 were experimental Soviet propelled artillery units developed during World War II. 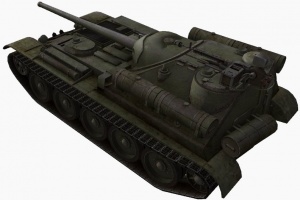 They were created in the Uralmash design office in the period from autumn 1944 until spring 1945. and were based on the chassis of medium tanks T-44 and T-34-85. Primary objective was to develop a vehicle that will eventually replace Su-100 in the soviet army. Two versions that were developed differed only in the main weapon: the SU-101, with 100-mm D-10 tank gun and SU-102, with 122-mm D-25-44S gun. 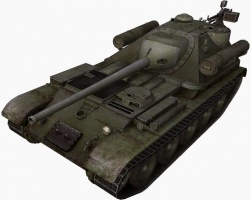 In April and May 1945, one or two prototype SU-101 and one prototype SU-102 were constructed. During the summer and autumn of 1945, both versions successfully passed factory tests and army trials. Despite the prospects and high performance for its time, with the end of the war, it was decided to terminate further development. Experience gathered during development of the SU-101 and SU-102 has been used in studies of post-war projects. 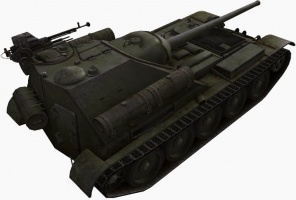 In the fall of 1944 UZTM (Ural Heavy Machinery Plant) began the production of a new medium SAU (self-propelled artillery unit) the SU-100, armed with the powerful 100mm D-10 gun. The machine possessed good maneuverability for its class, and with 75 mm of sloped armour had very good protection for its weight. 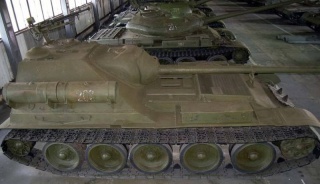 In comparison, much heavier assault gun SU-152 was also protected by 75 mm of frontal armor. 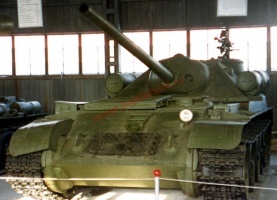 Nevertheless, Soviet self-propelled guns had a number of essential deficiencies, characteristic of any self-propelled gun with a forward fighting compartment arrangement. The adoption of ever longer barreled guns increased the overall dimension of the SPG lengthwise. The result of mounting a long overhanging gun low in the hull (to reduce its silhouette) was hampered maneuvering in narrow passages and limited mobility over undulating ground (the muzzle being driven into the ground) and wooded country. Furthermore, the center of gravity in such SAU was displaced forward, leading to an overloading of the forward road wheels, often leading to a breakdown of the chassis. In transit, it was also found to be impossible to satisfactory fasten the gun out of battery for travel. At the same time, further increases in the armor protection of German tanks and assault guns required an adequate increase in the combat capabilities of Soviet tanks and SPGs, which entailed the adoption of ever longer barreled guns of greater power. 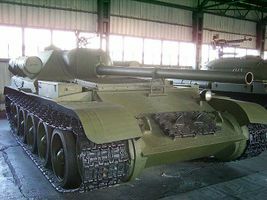 To design such a tank destroyer, based on the chassis of the T-34 tank became practically impossible. A new chassis with a more rational arrangement of major units and subassemblies was necessary. 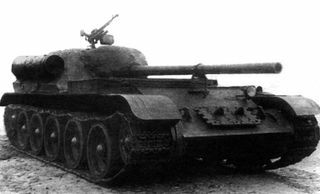 -	SU-122P: armed with the 122 mm D-25S gun, at that time with a prototype prepared and having successfully passed manufacturing tests. -	ESU-100, armed with the 100 mm D-10S gun, with a rear fighting compartment and electro-transmission. -	SU-M, armed with the 100 mm D-10S gun, based on the chassis of the T-34 tank, with a rear fighting compartment and with the engine moved to the front. -	SU-M, armed with the 100 mm D-10S gun, on the chassis of the T-44 tank, with a rear fighting compartment. -	SU-44, armed with the 122 mm D-25-44S gun, with the use of subassemblies and chassis of the T-44 tank, and a forward fighting compartment. The technical review board recognized the Su-m and Su-44 as the best of the projects; and by order of directiveNo.625 to the tank industry, dated October 26, 1944 to the plant of UZTM, it was proposed to finalize the design, to distribute drawings and prepare prototypes of the SU-M and SU-44. In December 1944, during the course of further development work on the Su-44 it was found that the weight and overall size of the machine was too great, basically because of the five-meter barrel of the D-25S gun. At the same time the SU-M with the rear fighting compartment was found to be compact, its length shortened and its weight consistent with the chassis of tanks in the medium class, while armor was considerably strengthened. Based on these results, the solution accepted was to continue work only on the SU-M, and all work on the Su-44 was terminated by NKTP order No.107, dated March 7, 1945. By the same order the design obtained the designation “Uralmash-1” (Ural Heavy Machinery Plant im. Sergo Ordzhonikidze) and was assigned a date for the production of the first prototype, May 1 1945. It is here interesting to note that the project of SAU “Uralmash-1” (Ural Heavy Machinery Plant im. Sergo Ordzhonikidze) was developed by the design bureau of the plant of UZTM (Ural Heavy Machinery Plant) under the management Of l.Gorlitskogo still in August 1943, but it was not approved BY NKTP and was “frozen”. In the development of design documentation, the following designers were enlisted: .M.Lekhttsind, I.I.Emmanuilov, A.G.Gayvoro nskiy, G.F.Ksyunin, I.F.Vakhrushev, L.A.Pinus, E.A.Karlinskiy, E.I.Linkova, D.A.Geriev, V.L.Likhomanov, N.N.Efimov, A.D.Nekhlyudov and others. The general leadership was given to the chief designer L.I.Gorlitskiy. The production of two prototypes was conducted during March-April. The first being marked as Su-101, armed with 100 mm D10s gun, and the second, marked as Su-102 with a 122-mm gun D -25s gun. 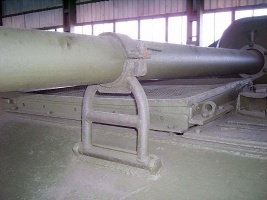 The housing SAU was welded from the rolled armor sheets, by which were given the rational slope angles. The thickness of the frontal sheet of housing was equal to 90 mm with the angle of the slope of 27 degrees, the thickness of the frontal sheet of felling - 122 mm with the angle of the slope of 35 degrees. Onboard sheets had a thickness of 75 mm, stern sheet - 40 mm. In this case the stern sheet of housing and felling was carried out by general. Rectangular entrance port, which was being shut by armor doors, was placed on the right side. Round hatchway with the revolver housing mounted the panoramic viewfinder for the commander. 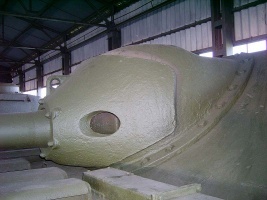 Gun D -10s was established in the frontal sheet of housing in the cast armor mask. Its stem spoke in favor of the overall sizes of the housing only on 630 mm. Angle of elevation was 18 degrees, depression was – 2 degrees, and the angle of horizontal guidance was set at 22,5 degrees. The height to bore of gun - is 1760 mm. Ammo rack had a total of 35 rounds. Sighting telescope TSH-19 was installed in addition to one separate panoramic periscope. 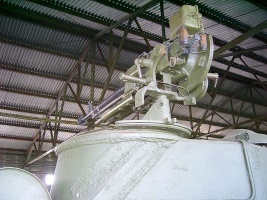 For anti-infantry and anti-aircraft protection, a standard 12,7 DSHK machinegun with a total of 450 round was installed. Engine V-2-44 was located along the axis of machine in the forward section of the housing to the right. Driver was placed on the left side of the engine. The aggregates of power transfer were borrowed from the tank T -34 with some modifications to handle the new chassis. 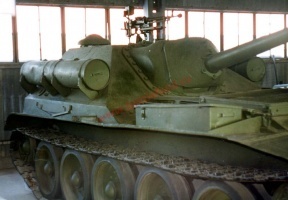 The suspension was completely borrowed from the T-44. With the overall mass of only 34,1 tons the vehicle was able to reach the maximum speed of impressive 54 km/h. Crew consisted of four. For the external communication Su-101 used standard 9- RS radio device, while internal comm. Was handled by TPU-3bisF device, by light signaling and tankofonom for the two-way communication of commander with the driver. 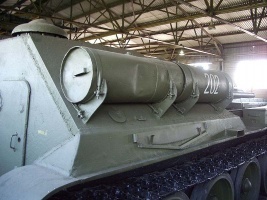 Su-102 from Su-101 differed only by it only by its main gun, 122-mm gun D -25s. Angle of elevation was equal - 18,5 degrees, depression was at less than half degrees virtually non existing (0 degrees and 24 minutes to be precise), the horizontal traverse was 19 degrees. 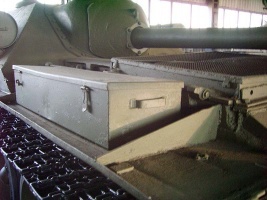 It is remarkable, that with the apparent small dimensions of the fighting compartment ammo rack composed of 28 shots. Very impressive number considering that 122 mm ammo was in two pieces, propellant separated from the round itself. Total weight of the vehicle grew insignificantly to 34,8 tons. During the autumn of 1945 several issues were noticed, and needed to be fixed prior to finalizing the construction. It was necessary to modify a number of mechanisms and devices, in particular the aggregates of ventilation and engine cooling and the internal crew fighting positions. As a result the intensive work of designers and techinicians was implemented to fix the problems prior to the the start of the field tests. Self-propelled units “Uralmash (Ural Heavy Machinery Plant im. Sergo Ordzhonikidze) -1” had a number of advantages in comparison with previously created domestic SAU. New layout made it possible to make a machine of of more compact, increased the possibility of maneuver in the limited passages and in the broken ground. Crew now could if necessary leave the machine through the stern hatchway under the cover of housing. Powerful armoring also became the result of denser layout. The general estimation of the construction of housing after the range tests by firing was very high: the housing of SAU “Uralmash (Ural Heavy Machinery Plant im. Sergo Ordzhonikidze) -1” proved to be on a higher level than the housing of all other mass produced tanks and SPGs, including IS -2 and ISU-152. Load distribution was also much better and it noticeably decreased wear of the materials. The arrangement of the fighting compartment on the back left an option of mounting even longer barreled guns in the future. No matter how hard they tried, the engineers could not fix all of the problems. It was impossible to improve crew conditions in the very cramped crew space. Cooling was improved, but still condition for the driver were very harsh, and during hot weather almost unbearable. 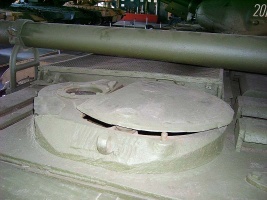 Also, the roof of the vehicle showed signs of shockwaves from the powerful guns, especially in Su-102 prototype. Both SAU successfully underwent all tests and according to their results they were recommended for the adoption in the Red army. Despite the prospects and high performance for its time, with the end of the war, it was decided to terminate further development. One of the survived prototypes Su-101 is on permanent display in the Moscow Kubinka armor museum. * The two prototypes of this vehicle were never fitted with the 100 mm D-54S nor the 122 mm M62-C2 cannons. This page was last modified on 12 March 2018, at 08:49.